Api Wenuwen Api gathers momentum in the UK. At the end of a presentation programme held at the London Buddhist Vihara on Sunday, Mr. and Mrs. Kingsley Fernando from London undertook to pay the total cost for a home to be built for Sri Lanka Tri-services personnel, under the scheme “Apiwenuwen Api Housing Project”. Mr. And Mrs. Fernando presented the pledge in writing to Brigadier Prasad Samarasinghe, chief organiser of the London fund raising programme. Head of London Buddhist Vihara Chief Sangha Nayaka of Great Britain Most Venerable Bogoda Seelawimala Nayaka Thero was also present at the event Api Wenuwen Api Fund is a collaboration between the The Ministry of Defence and the Central Bank of Sri Lanka. Aim of this unique effort is to build 50,000 houses with moder facilities for the Tri-Service personnel.The project is phased over five years, with 10,000 houses to be completed each year. Already 1620 housing units are being built in Ipolagama, and are expected to be completed soon. Stage two will begin in Horowpathana. Each housing project also includes schools, shopping complexes, gymnasiums, and other facilities. These, along with new roads and other services will ensure that the surrounding region will also benefit from significant infrastructure development. Festival of Cricket in London is the largest Sri Lankan carnival in UK. It was held for the 20th consecutive year on 13th July 08 and over 5000 Sri Lankans were attended. Brigadier Prasad Samarasinghe (Defence Adviser London) met with His Excellency President Mahinda Rajapaksa in London on 12th June to introduce the Api Wenuwen Api fund-raising campaign in the UK for the Ministry of Defence project of building 50000 houses for disabled and serving tri services personnel. The Defence Adviser made special mention of the input of Sri Lankan expatriates living in the UK who have co-operated in organising and supporting such a worthy campaign. This resulted in a significant increase in the number of volunteers who have opted to support this noble campaign and numbers are steadily rising. Brigadier Prasad Samarasinghe also demonstrated the campaign's official website www.apiwenuwenapi.co.uk to the President and explained the various links on the web pages including an online payment system for donations and ticket purchases. The President admired the design and structure of the website, which was generously orchestrated and donated by Dushmantha Wijekoon and designed by Amal Weerathunge. Methods of fund raising through the upcoming Legendary Cultural & Musical shows organised in London, Birmingham and Manchester, raffle ticket sales, various types of donations and sponsorships were highlighted. Brigadier Prasad Samarasinghe demonstrating the campaign's official website www.apiwenuwenapi.co.uk to the H.E. President. Venerable Galayaye Piyadassi Maha Thera said Sri Lankan expatriates should slow down on expensive parties on their cocktail circuit and contribute, at least, part of that money for the mother who nourished them, and brought them to the present affluence in the first world. “Our mother land- Sri Lanka gave us free education, like no other country in the world that helped everyone living in the West more affluent than our own brothers and sisters back at home. Please remember we owe much to Sri Lanka, especially the soldiers who lay their lives to protect the country at this hour of crisis,” Piyadassi Mahathera said addressing a large crowd assembled to commemorate the Ranaviru Day at the Saddhathissa Buddhist Centre in Kingsbury London. June 7 was commemorated as a remembrance day for Sri Lanka’s fallen soldiers and the ones disabled in the current war in the country. He said time has come up for those who put up affluent parties among Sri Lankan expatriates, by allocating at least part of that money for the country who made them educated enough free of charge to become what we are in the West, Piyadassi Maha Thera said. He said he was satisfied by the tremendous service done by the armed forces of Sri Lanka to save part of our population from the jackboot of Fascism and deliver back their democratic rights to them. The Maha Thera said it was the prime duty of all expatriates to look after the disabled soldiers who are being treated at rehabilitation centres and the children of the brave soldiers who have been felled by the bullets of the enemy. A cheque worth Sri Lankan Rupees 12.5 million from the funds raised by Sri Lankan expatriates in California USA was handed over to President Mahinda Rajapaksa to go into the 50,000 houses for soldiers program now in progress in the country. Chairman of the Ranaviru Foundation in Los Angeles Dr. Mohan Kumararatne handed over the money at a brief function in the Temple Trees, the official residence of the President. The funds were raised under the leadership of the former Los Angeles Consul General Jaliya Wickramasuriya in largely attended and well organized cultural shows and musical extravaganzas where mostly talented artists, dancers and musicians from the armed forces showed their talents. Wickramasuriya, who is now the ambassador-designate to Washington graced the occasion. The President said the expatriates should be congratulated for gratefully remembering the soldiers who have laid their lives for the sovereignty and territorial integrity of the nation. The program christened, (Api Wenuwen Api ) has already built 1620 housing units at the cost of 2.4 million each at Ipologama, near the ancient city of Anuradhapura . The second phase of the housing scheme would come up in the same area in Horowpathana. The government expects to spend one million Rupees for a house and the soldiers who would eventually own the houses would pay a sum of 800,000 Rupees in a phased out amount spanning during a period of 20 years. The rest would come from philanthropists. Secretary of Defense Gotabhaya Rajapaksa and Raja Edirisooriya who helped the program in California participated in the event. The Ranaviru Commemoration Day falls on the 7th of June every year, and is a National Event. The main event on this day is held at the beautiful Ranaviru Remembrance Park at Mailapitiya - Kandy. By tradition, the incumbent President of Sri Lanka is the Chief Guest at this Event. Many family members and loved ones of those Killed and Missing in Action congregate at Mailapitiya to commemorate their heroes. This is a very detail oriented and solemn event where those who laid down their lives while protecting the territorial integrity of Sri Lanka are remembered with gratitude. On every Ranaviru Commemoration Day, the public is requested to light a lamp at 7:00PM in their homes, temples or other religious places to commemorate these valiant servicemen, bestow merit upon their souls. They sacrificed their tomorrow for our today. This year, it is our intention to make this commemorative lamp lighting event worldwide. As Sri Lankan Patriots, this is a wonderful opportunity for us to spend a few minutes of our time on the 7th of June, to show our gratitude to the 22,000+ servicemen killed or missing in action. People give true meaning to Be Together for All. With the unconditional support of the public, the joint venture between the Ministry of Defence and the Central Bank of Sri Lanka known as the Api Wenuwen Api Fund, has now officially reached the Rs. 200 million mark. Sri Lankans both at home and abroad have rallied around to give true meaning to the term Be Together for All, contributing generously towards providing permanent housing to the those dedicated men and women of Sri Lanka Armed Forces. 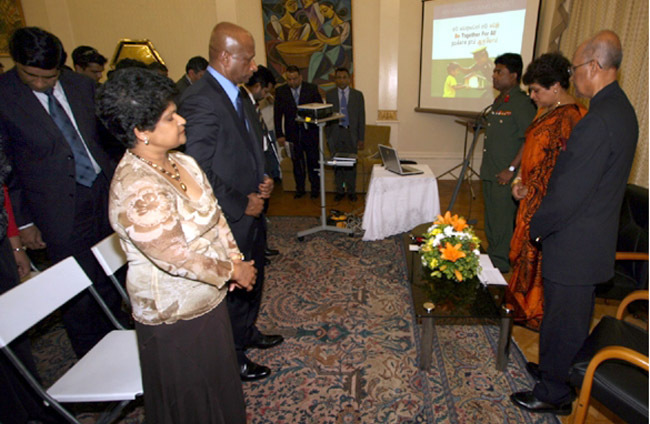 “Api Wenuwen Api” fund raising campaign in UK was ceremonially launched on 6th May 2008, at the Sri Lanka High Commission in London, with the hand over of the first raffle ticket book by Major (retired) N L C Perera, who had served the Sri Lanka Army for 26 years since 1949, to Her Excellency Kshenuka Senewiratne, Sri Lankan High Commissioner to the UK. 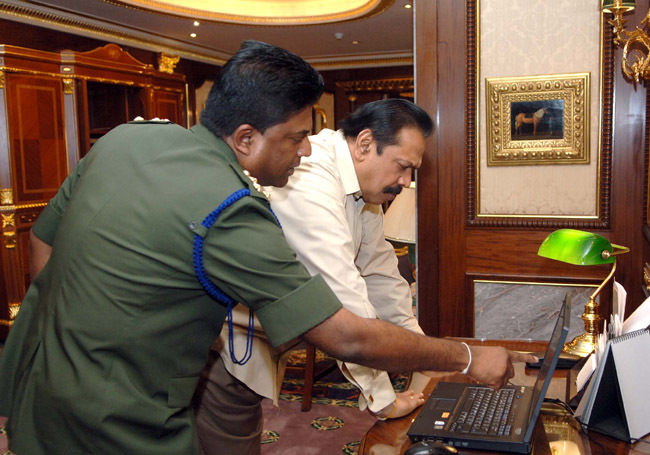 The objective of the campaign is to raise a minimum of 100,000 sterling pounds, towards the housing project for serving the disabled service personnel.Three Sri Lankan musical and cultural shows will be held in September 2008 in London, Birmingham and Manchester featuring artists drawn from the Sri Lankan Armed Forces. Donation towards this project could be contributed to “Api Wenuwen Api” / HSBC account number 31676121 (branch sort code 40 - 05 - 19), or by cheque in favour of “Api Wenuwen Api” addressed to Defence Adviser, Sri Lanka High Commission, London W2 2LU.